As you will soon learn, if you read back through this blog’s entries or glance through the posts on Dog Jaunt’s Facebook page, I’m a big fan of the large SturdiBag carrier for in-cabin airplane travel. It’s officially too large for many (most?) airlines, but because its top is so flexible, it’s worked on every flight we’ve taken with it. The part of it that isn’t flexible, however, is the base. It’s a solid 18 inches long — and because I typically choose to orient Chloe’s carrier left-to-right under the seat in front of me, I have to choose my seat carefully. Why left-to-right? The front-to-back depth of most under-seat spaces is about 17 inches, and I haven’t wanted to vex the flight attendants, focused as they are on the “area around your feet.” On recent trips, I’ve turned Chloe’s bag front-to-back, so I can pat her more easily during takeoff and landing, but if I’m called on it, I want to have the option of being able to tuck her carrier away properly. When you look at the under-seat measurements I’ve collected, therefore, you’ll see that I’ve gravitated towards the seats that provide the most under-seat width. A while back, a reader sent me a note with a fine idea: Why not saw off an inch of the foam board that stiffens the base of the SturdiBag? Chloe would never notice the loss, and it would have the happy effect of (1) making the carrier closer to an airline’s official maximums, should you meet an airline agent with a tape measure, and (2) allowing the carrier to fit in more under-seat spaces. Here’s what you do: Unzip the compartment that holds the foam-core base, located just below the carrier’s mesh front door. Pull out the base and, using a box cutter and a straight-edge and a self-heal mat (or a layer of scrap cardboard), slice an inch off one of the short ends. My husband assured me that he’d really need to buy a circular saw to do the job right, but I’m on to his tricks. What if you just pull out the foam board prior to take-off, put it in another carry-on bag (or just in the overhead bin), squish the carrier under the seat and then after take-off slip the board back in? Then repeat for landing. Just a thought so you don’t have to permanently alter your bag. Hi, Cristina! It’s a bold idea, and I’d like to hear how it works for you. I’ll hold off, myself, because I think Chloe would be unhappy to be carried, even for a short time, on an unsupported bag bottom, and it might make her uneasy to feel her foundation being reinstalled en route. That’s just Chloe, though — another dog might handle the process with aplomb. If you try it, please report back! Hi there! Chloe’s a Cavalier King Charles Spaniel — there’s more about her and her current size in the blog’s “About” section. I have considered having a second base board made that is 17 long and 11 wide, that I could substitute if it looked like there might be a problem. That way the original board is intact, but the smaller one only loses an inch all the way around, but will comply with most airlines length and width, leaving only the height to negotiate. Does this sound reasonable? It does, Samantha! It’ll make the bag look a little saggy, but a base that size will still support your pup just fine, and I like the psychological appeal of having it there and swapping it out in front of the ticketing agent, if need be. they would measure it for me it would fit in their box . I ordered the large and had it shipped 2 days before my flight I am now waiting praying . The man assured me also that he takes these carriers as well on his flights from Seattle where his company is located. he also said that he went to some airline functions with all the major ones and they all agreed that the sturdi carrier was used more on flights due to its conform ability under the seats . he also said If i had any doubts or they didnt accept it I could get a full refund. i did pay about double for it with the rush delivery so i would have peace of mind . Ill write again after my travels to speak of such a hopefully wonderful product as you you have spoken about . Ta million stars of thank you . Thank you so much, Lee, for the kind praise and for the report about your interactions with SturdiProducts — it really does sound like they took a lot of the worry out! Please let us know how it goes. Safe travels, and I hope you guys have a great time in Hawaii! Thank you to Dog jaunt !!! I Love this blog. So extremely helpful! After exhaustive research, I have just purchased the Sturdibag XL, for my midsized, 28 pound beagle mix. As others have said, the bag seems pretty large and has caused some anxiety about getting it onboard Southwest for under seat travel. Here are the ideas I have come up with to help make this dream a reality: Idea # 1) Board size in bottom of carrier: the XL board size measures 20″L x12″w (the bag is 16″H, but flexes to much smaller). Others have mentioned cutting the board, so that it has the needed airline measurements. I considered that, and even sent my husband to Home Depot to get the needed exact knife, etc. But then Dawn broke over Marblehead and lo and behold: I called the Sturdibag customer service # ( 1-800-779-8193) and asked if I could purchase the Large sized board that normally fits into the L sized sturdibag. No Problem! It only costs $4.95 & they can ship it . (I’m paying more for FEDEX delivery but due to my upcoming flight that is how it has to be.) This new board size measures: 18″L x 12″ wide. Perfect to meet Southwest’s requirement of 18.5″L x 13.5″ wide.!!!! I might still have to convince the attendant about the bags flexible top, but knowing the bottom meets requirement has eased my mind significantly. Idea # 2 : I borrowed my friends Southwest boarding sticker, from the last time she flew with her dog. (Her dog uses a med. Sized Sherpa and flies worldwide without issue) I stuck her sticker onto my new bag’s handle and voila, that should be an added level of getting him past the check in attendants. Idea #3: Which I thank this blog for (especially Adam) , I have saved a few photos of other dogs flying with the sturdibag XL on Southwest flights onto my phone. That way I can show the check in person, the bag has flown on SW before, therefore we should be allowed to fly again. I will post an update to let you all know how it works out! Thanks so much for the praise, Dani, and I’m looking forward to your update — you’re seething with ideas, and I want to hear how they work for you! I love this idea! I think I’ll order the SturdiBag L and see if I can order the small board with it and otherwise just cut it like you suggest. I’ll use the bag as my carry on on the trip from Holland to UK (just put my hand bag in there), so I have the tag that it has been carried in a KLM flight before. 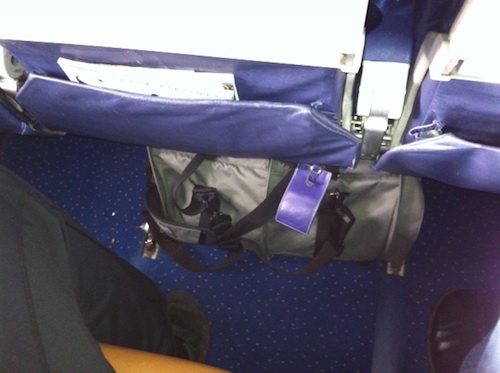 During that flight I’ll take some pictures of the bag under the seat of a KLM plane so I can show it on the way back. Plus the smaller board so it meets their size requirements as well when flexed. I’ll also bring an extra (super) small bag, just in case they make a fuss anyway (maybe just the sturidbag small if I can find one, so far I’ve only found L and XL in the netherlands). It won’t be as comfortable, but at least we’ll have an alternative ready. I’ll let you know how things went (please send me an e-mail if I forget, MA). This blog helped me so much already, I’d love to help others out with my experiences as well. I love all of these ideas, Agnes, despite my hideous silence ’til now. I hope and trust that the trip went okay? I’m offended at the suggestion your husband has “tricks” in regard to using the right tool for the job. You should instead commend him for being so conscientious, that he care enough to make your little foam board thingy have a proper edge. In fact, if I recall, the SturdiBag core has a rounded corners. I’m surprised he didn’t also note the necessity of a new router to accomplish a proper adjustment. I have just purchased the XL sturdibag for my two male cats. I like the flex feature. I will demonstrate this if questioned about size ay Southwest counter. Hopefully we will be able to board. Only 2 and 1/2 hour flight from Vegas to Missouri. Anyone have any more suggestions other than Good Luck? I use the XL Sturdibag on Southwest all time. You should be prepared to show check in counter how it flexes if questioned, then also show them photos of the bag in place on a Southwest plane( check this website or the internet to find a few pics) . Once you get the boarding tag stuck into the handle of your Sturdibag , keep it on! Do not remove it until you check in for your next flight. Once the agent sees you have flown with the bag before they should let you check in and fly no problem. Stay confident , and know that it will fit under the seat and you will make your flight!!! Hope this helps.